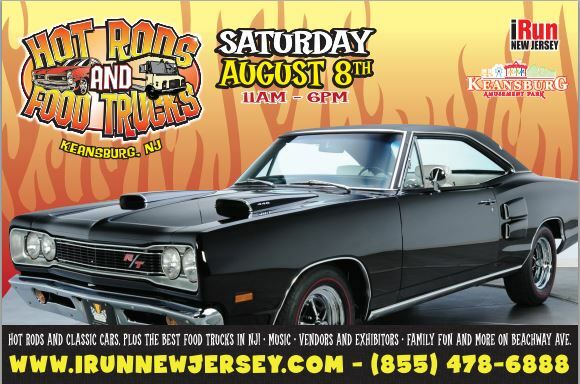 Classic Cars and Food Trucks will pull into Keansburg Amusement Park and Runaway Rapids on Saturday, August 8th 2015 from 11am to 6pm. The classic car show and food truck event will take place along Beachway alongside the amusement park and the water park. There will be street rods, custom cars, rat rods, imports, survivor cars and the classic corvettes, food trucks, vendors and a DJ. Classic Cars and Food Trucks will pull into Keansburg Amusement Park and Runaway Rapids on Saturday, August 8th, 2015, from 11am to 6pm. The classic car show and food truck event is hosted by Keansburg Amusement Park and iRun New Jersey. The classic car show and food truck event will take place along Beachway alongside Keansburg Amusement Park and Runaway Rapids. Classic cars will align Beachway and will feature an array of cars including modified cars ranging from the 1930’s to the present, street rods, custom cars, rat rods, imports, survivor cars and the classic corvette. Food trucks, vendors and a DJ will also be featured on Beachway. Trophies will be awarded for both cars and food trucks! Keansburg Amusement Park and Runaway Rapids will be open for sliding and riding fun! Admission to both Keansburg Amusement Park and Hot Rods and Food Trucks is free to the public. Food, drinks, rides and slides must be purchased. Keansburg Amusement Park offers unlimited rides for $36.95 per person or a combination bracelet for Keansburg Amusement Park and Runaway Rapids which includes 3 hours admission to Runaway Rapids and unlimited rides at Keansburg Amusement Park for only $46.95 per person. Keansburg Amusement Park and Runaway Rapids continues its 111 year tradition of offering family fun on the Jersey Shore. Park attractions include rides, water park, games, go karts, fishing pier, batting cages and classic Jersey Boardwalk food. Visit Keansburg Amusement Park’s website at www.keansburgamusementpark.com for more information on admission and group outings.